Eight Years in Afghanistan: Can the U.S. Still Win? President Obama will again huddle with his national-security team on Wednesday to decide how many more troops  if any  to send to Afghanistan. But making the decision will be the easy part, the real challenge will be getting those extra boots onto the ground. If he ends up embracing Army General Stanley McChrystal's call for 40,000 more soldiers, deploying them in Afghanistan will take up to a year. The first bottleneck between the Oval Office and Afghanistan is the country's lack of sea ports (the nearest harbor is some 400 miles away) and a dearth of airports. Beyond geography, the flow of troops is limited by the U.S. military's requirements for training and dwell time  R&R at home, between deployments. And then, perhaps most critically, there is the enemy. The Taliban's lengthening shadow across Afghanistan is making it increasingly difficult to supply the 65,000 troops there now or to send in reinforcements. "We're resupplying between 30% and 40% of our forward operating bases by air because we just can't get to them on the ground," says a senior Army logistician, speaking on condition of anonymity, referring to the roughly 180 U.S. outposts around the country. That's because the Taliban control much of the "ring road," a circular route that links Afghanistan's few major cities. "Trucking contractors trying to supply some of them aren't making it," he adds. "The Taliban are just wiping them out." Such constraints will limit the flow of troops to Afghanistan to about one brigade  some 4,000 troops  a month. 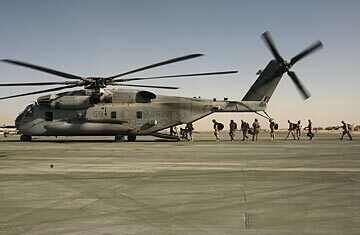 Most U.S. troops arrive in Afghanistan via air, largely through the Manas air base outside Biskek, Kyrgyzstan. But little of their gear gets there the same way. Instead, it's crammed aboard ships, departing primarily from U.S. ports for the 45-day voyage to Karachi, Pakistan. Then there's at least two weeks of ground travel into Afghanistan. The challenge, says one Marine officer preparing to head to Afghanistan if Obama gives the order, is to marry up his unit's 5,000 troops with their gear, including 2,000 vehicles, somewhere in the middle of Nowhere-istan at the same time. "There's a lot of physics you can't overcome when it goes by sea," he says. All his gear, except for vehicles carrying top-secret communications gear, will get there by ship. "You don't want those," he notes, "going by container ship through Karachi." Defense Secretary Robert Gates calls Afghanistan's infrastructure "primitive," while the officer who coordinated shipping war material to Saudi Arabia for the first Gulf War says its mountains make things worse. "The terrain in Afghanistan is so much tougher than in either Iraq or Saudi," says William (Gus) Pagonis, a retired Army lieutenant general. "You could film a biblical movie in Afghanistan without props." The U.S. has been improving Afghanistan's meager road network to enable farmers to ship perishable crops  other than opium paste  to market, and to deter IEDs, which are easier to detect in fresh pavement. The current U.S. ambassador to Kabul, Karl Eikenberry, emphasized the importance of roads during his service in Afghanistan as a U.S. Army general. "Where the roads end," he'd say, "the Taliban begin." Logistical woes persist even once U.S. troops are at their assigned outposts. Private truck drivers "strike often, delay delivery of fuel or arrive at destinations with fuel missing," the Government Accountability Office reports. In June 2008, 44 trucks and 220,000 gallons of fuel were lost to enemy attacks or plunder. Beyond the convoy attacks, the U.S. has used Russian aircraft to fly armored vehicles into the country, and is seeking private contractors to defend U.S. bases and convoys across the entire country. The Pentagon's pending solicitation says interested companies must be capable of preventing "any intrusion by unauthorized personnel, theft, destruction of, or damage to property within the secured boundaries, and the facilities themselves." That's a tall order that even the U.S. military hasn't been able to fill. The Pentagon's reliance on an army of logistical and other support forces was made clear Tuesday, when the Washington Post reported that the 21,000 combat troops ordered to Afghanistan by Obama would be accompanied by an additional 13,000 so-called "enablers." While that doesn't change the current authorized U.S. force level of 68,000, it did reveal, according to the White House, that not all of the support troops ordered to Afghanistan by President Bush had arrived by the time he left office. Such forces can literally be lifesavers. Before this year, there were so few rescue helicopters in Afghanistan that it averaged two hours to get wounded troops to medical care  double the desired "golden hour." "We had not had a double amputee survive those wounds in Afghanistan until this kind of additional air power came along," Gates noted recently. "Now they are being saved." Jittery over repeated attacks on its supply convoys traveling through Pakistan, the Pentagon wants to shift much of its resupply effort to its new Northern Distribution Network, which runs through several central Asian states, including Tajikistan and Uzbekistan. "They're a pretty dodgy bunch of allies," said Paul Quinn-Judge, Central Asia director of the nonprofit International Crisis Group, from the Manas air base in Kyrgyzstan. More significantly, he fears that such stepped-up U.S. shipping will lead to attacks on convoys by terrorist groups including the Islamic Movement of Uzbekistan and the Islamic Jihad Union. "The problem with the Northern Distribution Network is obvious," he says. "It turns Central Asia into a part of the theater of war."